Now, on a completely different subject, I received an e-mail today from a friend. It was a report by CBS. Though news to me, it was actually published in 2004. CBS reported, in 2004, that the council of the city of Hamtramck, Michigan was expected to make a noise ordinance amendment so that a mosque in that town could play the Islamic call to prayer five times per day over loudspeakers. The secretary of the mosque in question stated “We are not [proselytizing]…We are calling our Muslim people, reminding them they are obligated to come to pray.” Some defending the request for the ordinance amendment argued that the call to prayer is no different in nature and purpose than the ringing of church bells. This issue is still relevant, so let’s get into it. But, before getting into the issue of the content of the message, let us deal with the ordinance at hand: it is about noise. There is nothing wrong with a law that limits the volume at which things can be played/sounded. It is a matter concerning the use and enjoyment of property. If I play my music so loudly that the windows of your house are rattling, I am violating your property rights. And, frankly, if I cannot help but hear your music inside my house when my windows and doors are shut, you’re playing it too loudly. The same goes for the idiot with the 16″ woofers who likes driving down my street with the volume up so loud that it almost ruptures my spleen (no doubt he’ll be claiming a moral and legal right to make me pay for his hearing aids – through our socialized health care system – at the ripe old age of 22). The call to prayer is no different, in terms of volume. If it is playing such that you can hear it in your house, or such that it interferes with the peaceful enjoyment of your property, it is too loud. More to the point: it is entirely unnecessary to blast such a thing into the air if one lives in a civilized country. The reason: here, we have a little thing called a telephone. If the purpose of the call to prayer is “reminding [Muslims] they are obligated to come to pray”, pick up the phone and call them. Call them five times per day. It’s not difficult. Just ask all of the morons who spam my phone with offers to sell me windows and doors, better telephone plans, and the like. Or speak with any hotel operator about how they manage to automate wake-up calls for their patrons. Of course, let us be consistent: the same might in some cases go for church bells. They ring bells near my house, though not loudly enough to bother me. But were I living next door to the church – and several do live next door to the church in question – I’d probably want to throttle the guy ringing that bell every Sunday morning when I’m trying to get some sleep. So, in such circumstances, have some respect for your neighbour, and buy an autodialer. This is no mere call to attend a mosque. Many of the statements in the Adhan having nothing to do with the time of day, or with the act of praying. They are professions of what everyone is supposed to believe, according to Islam. If a person made these statements to you face to face, five times per day, one would rightly conclude that the person is – at the very least – itching for an argument, but more likely: itching for a fist fight. The simple fact of the matter is that this is not just about noise, and it is not just about calling Muslims to the mosque to pray. Public broadcasting of these statements, five times per day, is intended to create an mysticism-soaked environment akin to that found in the middle east. It is an attempt to force people, five times per day, to deal with someone barking at them that God exists, that Muhammad was his messenger, etc. It is no different, in fact, that someone ringing your phone five times per day and saying nothing at all. It is harassment. It is, as such, intimidation. And it has no place in the airspace of nation that values reality, reason, and the rational (hence peaceful) pursuit of ones own happiness on this earth, in this life. You cannot describe what does not exist. I testify that there is no deity to describe. I testify that there is no deity. I testify that nobody is or ever was a messenger of someone who does not exist. I testify that nobody ever was a messenger of a god. The time for rational thought has come. The time for rational action has come. The time for honest and independent thought has come. The time for independent, productive, peaceful action has come. Praying to figments of your imagination will accomplish nothing good. This life is the only one you will ever have. When you’re dead, you will cease to exist. There is no free lunch, so stop praying and earn your happiness instead. To add some fun, have a bet with your friends about whether you’ll be mobbed by angry Islamists – or angry Christians, for that matter – before the police arrest you. Incidentally: the amendment passed as expected. Hamtramck, Michigan is now considered “a model Muslim city”. 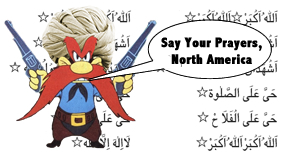 Wake up North America, or else prayer will be better than sleep, five times every frigging day, in your town too. Excellent analysis as usual, Paul. As a “cultural” muslim I agree with you.most azans are quite annoying. I have many memories of the prayer call in pakistan.funny thing, they would only call 3 times. Still a proper azan is quite moving for me just like an extraordinary ave maria. Sometimes political correctness can go too far but you are aiming at an easy target these days: the evil muslim who wants to take over your land. Gus Van Horn has addressed a similar issue in the following post. I’m going to drop a line to him about yours.